Simultaneously known and rather unknown, Verdi’s third opera and his first real success has been something of a stranger at the Metropolitan Opera House. 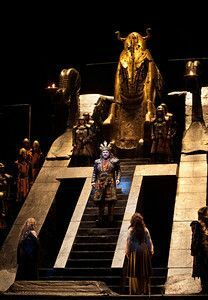 Nabucco first appeared at the old Met during the 1960-1961 – 120 years after Verdi completed the score. This production is only the second in the Met’s history. Opening night of the run was just the 57th performance. But, of course, Nabucco is also famous, largely because of one heart stoppingly beautiful part of it – the chorus, “Va, pensiero”. Surely, with its celebration of the Italian homeland, this sublime music touches Italian hearts most of all, but its beauty and power are so strong, so overwhelming that it usually stops the show. As it did for this performance by the Met chorus who honored the piece and its composer with a lyrical yet powerful reading. The audience reacted with prolonged and enthusiastic applause. This production, created by Elijah Moshinky, premiered in 2001. With its massive revolve comprised of two colossal architectural settings, the edifice seems to fill the massive Met stage. The first set is the home of the Hebrews – a sandstone edifice on which the singers perched and moved with evident care. The second is the marble and gold palace of Babylon, a giant staircase at its center. The set designer, John Napier, has substantial Broadway experience in over the top stagings of plays and musicals such as Equus, Les Misérables, and Cats. And it shows; his sets for Nabucco are wonderfully imaginative creations. Dramatic lighting effects by Howard Harrison emphasize the play of light and shadow, enhancing the sets and giving added drama to the music. The opera opened with the chorus arraigned across the stage, almost as a frieze. The image was visually stunning and also emotionally compelling, the figures, arranged in groups as they lamented, were very evocative of Renaissance paintings of lamentation, such as those by Giotto in the Arena Chapel. There are, of course, very few operas in which the chorus is without question the central protagonist. Nabucco is surely one of these. The chorus is heard in 11 of the 13 individual numbers of the opera. Verdi could not have wished for a better ensemble than the extraordinary chorus of the Metropolitan Opera. As is the case in Verdi’s early operas, the finer points of characterization are fleshed out in ensembles rather than solos. One such ensemble, a highlight of the evening was “S’appressan gli’ istanti,” Of the opera’s three main characters – Abigaille, Nabucco and Zaccaria – Matos’ Abigaille was the vocal and dramatic standout. There was much expectancy surrounding her performance. She made a stunning Met debut last season in Puccini’s La Fanciulla del West, so I waited to review this production until she appeared for her one and only performance. And she was worth the wait. Matos sang the punishing role of Abigaille with blazing intensity, dynamic nuance, stunning high notes, lovely vocal coloration, and breathtaking runs and coloratura. Her top notes were simply thrilling. In the title role, Zeljko Lucic delivered some lovely soft singing with superb legato. Nabucco’s prayer, “Dio di Giuda” was expressive with eloquent phrasing. But I found him vocally and dramatically too thin for this role. Nor was he persuasive in his descent into madness. Generally, dramatic and vocal power seemed to be missing. Yonghoon Lee sang the small role of Ismaele, ardent in vocal line as well as manner. He sang with effortless power and lovely tone. Lee was a very convincing young lover as was Elizabeth Bishop as Fenena. I heard him just two weeks before at the Richard Tucker Foundation gala. Carlo Colombara was a dramatically convincing Zaccaria. He sang quite well in the second half. Perhaps he just needed time to warm up. The other singers acquitted themselves very well. And the marvelous Metropolitan Opera Orchestra, conducted with verve, panache and great sensitivity by Paolo Carignani, was as always, splendid.